Poor Raccoon loves pizza, but every time he tries to eat some, he gets chased away with a broom. What’s the solution? 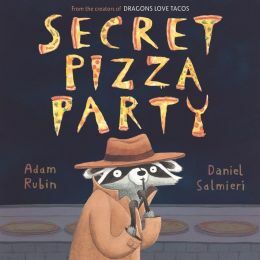 A secret pizza party! If it’s a secret, maybe no one will show up with a broom. Plus everyone knows when something is secret, it is more exciting. But will Raccoon’s clever disguise fool the pizza guy? (Or the raccoon-sniffing broom-bots?) If you love Bad Kitty, I highly recommend checking out this book with a similar style of narration and quirky sense of humor.